Hector Blair On Long Leave Here. His Brother Charles in Hospital in Italy. Proudly bearing four service stripes, Hector Blair is again in his native land and in his native town, Lindsay. One of the first to enlist here, Hector spent his 1st war Xmas on the ocean and had been overseas ever since till embarking a short time ago for home. He arrived here on Wednesday for a well earned, long leave. He spent a year in Italy and was in the hospital in North Africa with malaria. A brother, Chas. Blair, known as "Pud" Blair is at present confined to the 15th General Hospital in Italy with an injured foot. He will be there for a month and later will have to spend two weeks and possibly a month in a convalescent depot. He has been in Italy over a year with the 4th Field Ambulance Corps. Both are sons of Mrs. Milton Blair, 142 Lindsay St. S., and are well known in town. The two boys were together for a considerable length of time last spring. Both were in the Hitler line, both were in the Gustav line and both were in the Sangro River engagement. 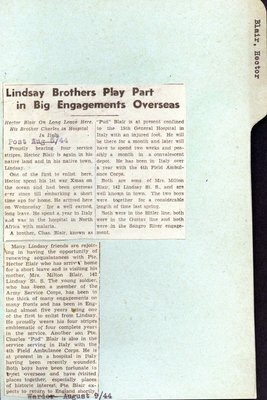 August 9, 1944 Many Lindsay friends are rejoicing in having the opportunity of renewing acquaintances with Pte. Hector Blair who has arrived home for a short leave and is visiting his mother, Mrs. Milton Blair, 142 Lindsay St. S. The young soldier, who has been a member of the Army Service Corps, has been in the thick of many engagements on many fronts and has been in England almost five years being one of the first to enlist from Lindsay. He proudly wears his four stripes emblematic of four complete years in the service. Another son, Pte. Charles "Pud" Blair, is also in the service serving in Italy with the 4th Field Ambulance Corps. He is at present in a hospital in Italy having been recently wounded. Both boys have been fortunate to meet overseas and have visited places together, especially places of historic interest. Pte. Blair expects to return to England shortly. This card is part of a larger collection of World War II personnel clippings. The project began in 1944 at the Lindsay Library. The intent was to gather together as much information as possible on the military record and the service of people from the Town of Lindsay and the County of Victoria (now Kawartha Lakes)who served in the war. To that end, during the years 1944, 1945, and 1946, members of the public donated photographs and updated information about their loved ones. Both library staff and the public saved and donated newspaper clippings. Some of the files contain great amounts of detail, while others have just a name.